Sri Lanka’s No. 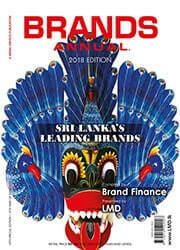 1 cable manufacturer, ACL Cables PLC was once again recognised amongst Sri Lanka's top 50 companies according to a study conducted by Brands Finance 2018. This is the third consecutive year ACL Cables has received this prestigious ranking which is compiled annually by Brands Finance, the local pioneers for independent brand evaluation and presented by the nation’s leading business magazine Lanka Marketing Digest (LMD). Earning further kudos, ACL Cables is also the only cable manufacturing company to be ranked amongst the Top 50 companies for three consecutive years. Additionally, the company has earned further esteem securing its position as the 3rd valuable consumer brand in the building material industry. ACL Cables has also been ranked 45th among the overall evaluation of the top Lankan companies. The evaluation model follows a seven-step process, beginning with identifying the top performing brands among companies listed on the Colombo Stock Exchange. The strength of a brand is determined through the developed Brand Strength Index (BSI). Further analysis into the brand is through its brand investment, brand equity and finally the impact on business performance. The above analysis for each brand is assigned a BSI score out of 100 which is then processed into the brand value calculation. Based on the score each brand in the league table is assigned a rating between 'AAA+' to 'D'. The brand valuation approach is calculated through a league table using the 'Royalty Relief' approach. As the No. 1 Cable company in Sri Lanka, ACL Cables holds 70% market share with revenue over Rs. 14.5 billion as a group. ACL Cables PLC continues to perform strongly with relatively high value additions. The company has introduced new innovative product categories such as fire resistant, fire retardant cables, fire survival cables, aerial bundled cables, low voltage transmission cables and the finest range of electric switches and sockets based on research and stringent testing via their laboratory.